JOHANNESBURG (miningweekly.com) – The acquisition of America’s Stillwater Mining has the potential to put South Africa’s Sibanye on the inside track of low-cost mechanised primary mining as well as provide it with deep insight into secondary mining – the recycling of platinum-group metals (PGMs). Both these inputs will help Sibanye to become the globally competitive South African mining champion that it is going all out to be. 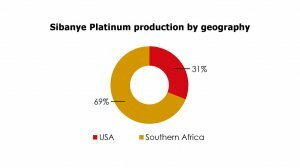 By putting its arm around the planet’s other platinum producers, Sibanye is boosting South Africa’s own Aladdin’s Cave of platinum treasure, which keeps the air above the world’s biggest cities clean, catalyses electricity generation in a manner that protects the environment and brings about a myriad of other crucial chemical reactions that make the world a much better place. A 400 kW platinum fuel cell provides four times more carbon reduction than a 400 kW solar photovoltaic farm, generates six times more energy and occupies 300 times less land. Little wonder then that South Africa’s Public Investment Corporation, as a major Sibanye shareholder and custodian of the pensions of South Africa’s civil service, has given its formal blessing to the Stillwater deal. Including Stillwater, Sibanye has now committed, mostly in hard cash, more than $2.8-billion to its future in platinum. 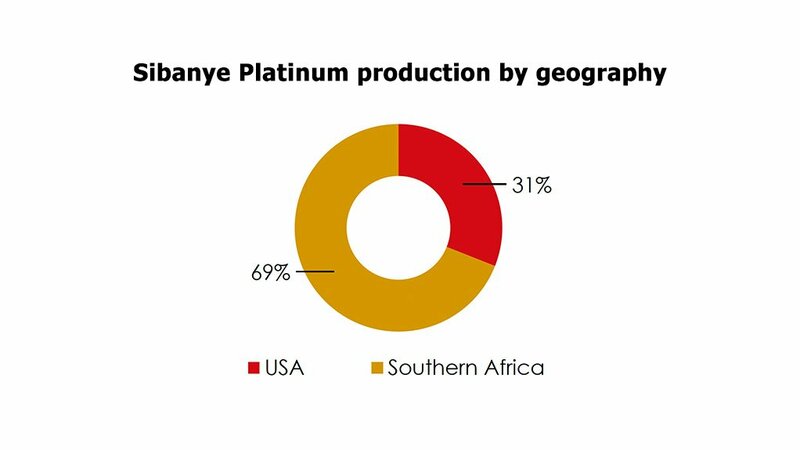 As a result of laudable cooperation between South Africa’s mature platinum mining companies, Sibanye has been able to make low-risk entry points into platinum by acquiring Rustenburg Platinum for $326-million and Aquarius for $294-million, which also takes it into Zimbabwe's Great Dyke. If the $2.2-billion Stillwater deal is approved by both sets of shareholders, Sibanye will then have operations in every known platinum province on earth, bar Russia and the Arctic. In doing all this, Sibanye has not forgotten its responsibility to its shareholders, who have received R3.5-billion ($298-million) in dividends since listing, and nor has it taken its eye off organic growth in gold, in which it is investing R3.6-billion. Gold has been extremely good to the company, exemplified by the notice given in October that its 2016 headline earnings a share will be at least 330% higher than in 2015. Since 2013, it has given its shareholders a remarkable 448% return on investment. But these spectacular returns to its shareholders have not been allowed to stand in the way of Sibanye doing things for all its other stakeholders, including providing the wherewithal for near-mine communities to become involved in impressive commercial farming activities, building quaint homes for workers who are assisted in a way that enables then to become outright owners of property and even converting polluted mine water back into cool drinking water to quench the thirst of staff labouring in hot underground working conditions. Under the leadership of CEO Neal Froneman, Sibanye oozes the kind of corporate patriotism that South Africa so desperately needs. It has agreed with Stillwater to pay $18 a share in cash, which translates to $2.2-billion for all the equity in Stillwater. Because the planned rights issue involves an increase in share capital, 75% of Sibanye shareholders will be required to approve the transaction. Once the transaction is closed in the first half of 2017, Sibanye will proceed with the rights offering. It plans to raise $750-million worth of equity capital in the rights issues, which will go into acquiring value rather than fixing a balance sheet that has gone wrong. The 1 400-employee New York Stock Exchange-listed Stillwater, which is headquartered in Colorado, last year generated a revenue of $726-million and an operating cash flow $110-million from the production of 540 000 oz of primary PGMs from two mechanised mines in Montana. Cash costs are a low $428/oz at the Stillwater mine, where the grades are a high 20 g/t, and $441/oz at the East Boulder mine, where the grades are just over 13 g/t. Reserves are sufficient for another quarter century of mining. 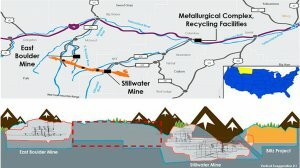 As mine-to-metals business, Stillwater has smelting and base metals refining and is also one of the largest recyclers of PGMs; in its 2015 financial year, it recycled 551 000 oz of platinum, palladium and rhodium from secondary sources. It offers growth opportunity at its $250-million Blitz project, where new production will emerge in 2018, rising to 300 000 oz/y from 2021. Another project, the Lower East Boulder project at prefeasibility stage, offers another potential 200 000 oz of primary production a year. Further options include the Altar project in Argentina and the Marathon PGM-copper project in Canada. Part of the metallurgical complex has been designed for the recycling of old PGM catalysts, which in the third quarter of this year yielded a record 175 000 oz of PGMs. This secondary supply will, if the deal goes through, provide Sibanye with crucial strategic insight into secondary supply issues. “These first-tier assets will position Sibanye as a globally competitive South African mining champion,” Froneman told analysts and journalists at a media conference in which Creamer Media’s Mining Weekly Online took part. The metallurgical assets will also spur Sibanye on to mimicking in South Africa what Stillwater is doing in the US. Sibanye calculates the transaction will be value accretive on the net asset value from day one and move the company’s platinum division down the global cost curve. In addition, the generation of dollars should lower Sibanye’s cost of financing. The deal will allow Sibanye to overtake Lonmin to become the world’s fourth largest producer of four element (4E) PGMs, with additional ounces from the Blitz project taking it to being a producer of two-million ounces of 4E production. In gold, Sibanye is in the top ten with 1.5-million ounces a year and it sees the window of acquisition opportunity in gold reopening. 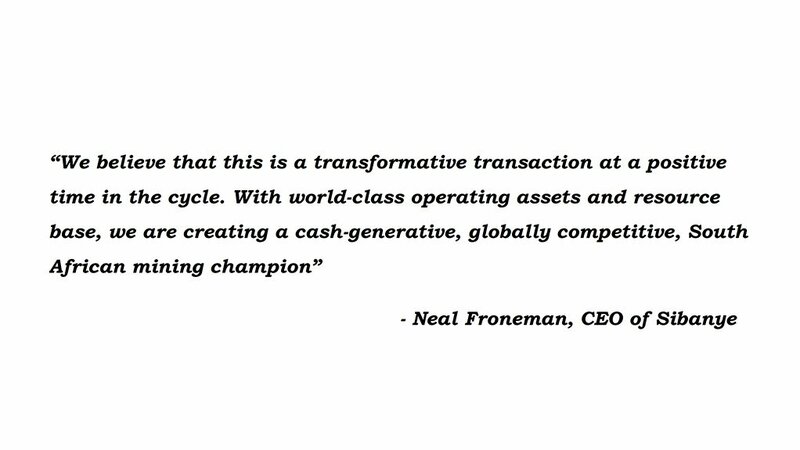 “We believe that this is a transformative transaction at a positive time in the cycle. 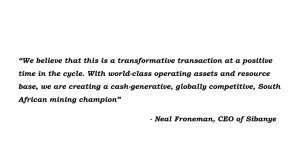 With world-class operating assets and resource base, we are creating a cash-generative, globally competitive, South African mining champion,” Froneman reiterated.